More than 10% of global electricity is produced from renewable energies, and the trend is rising. The UN programme on Sustainable Energy for All thinks that the percentage can rise to 45% of global power production in the year 2030. The rise of clean energy will bring a sharp fall in demand for coal power, which is already slowing down as some of America’s biggest banks are divesting from coal. Nigeria might soon be offered ‘tokunbo’ coal power plants for importation, as industrialised nations are phasing out coal. The rise of renewables goes hand-in-hand with the trend towards decentralized power generation. A growing number of power plants operate independently of the national grid, providing clean energy to citizens. Their size can range from large-scale megawatt grids to small-scale options of just a few kilowatts for a single household or business. The world’s largest private bank, Zurich based UBS, advised its clients and investors in 2014 that national grids are “not relevant” for future electricity generation, and that centralized power stations will become redundant within 10 - 20 years as electric cars, cheaper batteries and new solar technologies transform the way electricity is generated, stored and distributed. South Africa, known for its heavy dependence on coal power has in less than four years added 4,322 megawatt of renewable energy capacity. The competitiveness of renewables vis-à-vis fossil based power generation is evident in one of South Africa’s renewable energy investments: the Cookhouse wind farm feeds 138 megawatt of clean power into the grid at 5 US cents per kWh - half the price of new coal. 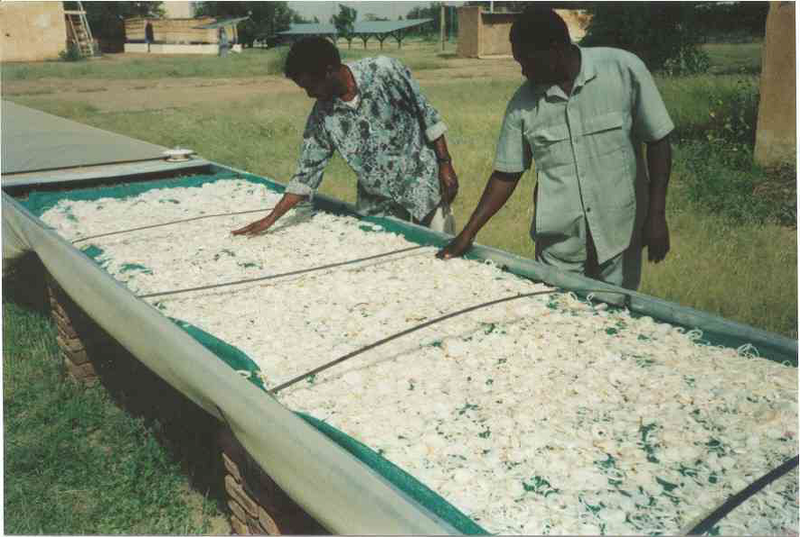 Fossil energy for a fossil Nigeria? In stark contrast with global developments, Nigeria’s government announced in 2014 to generate 30% of total electricity from coal. Meanwhile, renewables account for less than one percent of Nigeria’s energy mix, despite the enormous resource potential Nigeria has in solar, wind and non-fossil biomass. The prevalent perception about renewables in Nigeria is that the renewable energy systems and technology do not work. The loss of confidence in renewables as viable alternatives for electricity generation stems from bad experiences with imported sub-standard products and poorly executed projects. 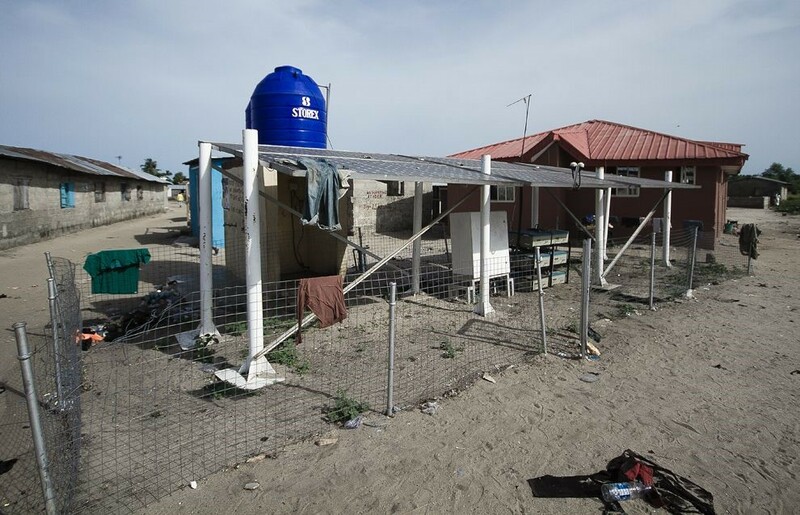 One example of poor execution is the Lagos State sponsored off-grid solar PV system in Bishop Kodija, which was meant to provide power for lighting, water pumps and fish driers in the fishing village. The system worked for three months and then stopped functioning, according to the traditional ruler. Faulty solar system at Bishop Kodija village. Creator: Yinka Obebe. This image is licensed under Creative Commons License.Poorly executed solar street lighting projects in Lagos, Sokoto, Borno, Nassarawa, Delta and Abuja that failed shortly after installation have served to deter further investments in renewables. In most instances, these bad experiences are caused by lack of maintenance, pilfering, poor quality imported products and components, poor design and installation. Technical expertise within the renewable energy space is few and far between, making it difficult to access quality services. Component retailers and contractors with little or no knowledge about the design and engineering behind providing renewable energy solutions end up executing failed projects. These negative experiences have overshadowed some significant successes in off-grid and grid connected renewable energy projects by professionals. Private sector developers are turning to renewables for captive power generation as Nigeria’s real estate, building and construction sectors experience strong growth. It is no wonder that Suleiman Yusuf, CEO Blue Camel, decided to incorporate rooftop solar hybrid systems on his block of serviced apartments in the heart of Nigeria’s capital city, Abuja. 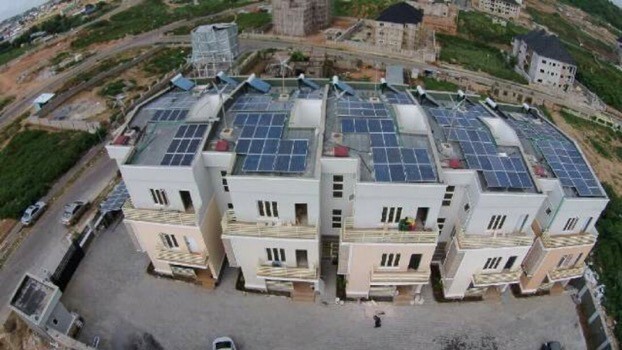 40kW off-grid solar-wind hybrid system for a block of apartments in Abuja. Creator: hbs Nigeria. This image is licensed under Creative Commons License.The cost of the 40kW hybrid solar PV-wind system will be amortized over the next ten years as service charges, which tenants are already used to paying in serviced apartments. Indirectly, Mr. Yusuf is saving the Abuja Distribution Company 40kW of power, which his apartments are not taking from the grid. Imagine the possibilities if new buildings in urban areas were obliged to self generate using rooftop solar hybrid systems. In underserved rural communities where extending the grid does not make economic sense, renewable energy technologies are becoming the main source of power supply. Green Village Electricity (GVE) installed a 24kWp solar PV system in Egbeke community, Rivers State in 2013. According to the CEO, Ifeanyi Orajaka, the solar PV mini-grid created 36 jobs within the community during the course of implementation. These included artisans like welders who fabricated the PV array structure, electricians who did the cabling, technicians and engineers who installed the panels and system components. The mini-grid provides electricity for 1,920 people living in 240 households, the community church, health center, school and market. In September 2015, GVE commissioned a 24kW solar PV mini-grid installation in Bisanti, Niger State. The system currently serves 1,600 people living in 200 households. Key to achieving success was that most of the projects highlighted were designed and managed by experienced private sector developers who are service and sustainability oriented. As such, there was no compromising on quality products and components, standard operations and maintenance measures, and all parties recognised the need to build lasting relationships with suppliers and end users. Renewable energy resources- solar PV, concentrated solar power (CSP), wind and non-fossil biomass hold promising potentials for Nigeria’s power generation. Taking into account all the suitable areas that can be used to generate power, Nigeria can get 32,456 terrawatt hours per year from solar PV, plus 10,045 terrawatt hours per year from concentrated solar, and another 12,867 terrawatt hours per year from wind energy. Small-scale solar PV rooftop or ground-mounted systems can provide backup power supply as stand alone solutions for individual households and small businesses with predictable energy consumption patterns such as schools, health centers, provision stores, barbershops, tailors, restaurants and market stalls. Smallholder farmers, the majority of whom are women, can benefit immensely from solar powered solutions for function specific uses such as irrigation and food processing. Farming yields and incomes can increase significantly with access to solar water pumps with a drip irrigation system, solar powered grinding machines and solar food dryers. On a micro-level, quality solar lanterns can substitute for kerosene lanterns used in over 15 million off-grid households. These can reduce the effects and mortality from indoor air pollution. Undoubtedly, Nigeria needs to increase its power generation capacity by strengthening its base load with conventional power systems from plants that can generate steady flow of electricity into the grid, independent of variables such as sunshine hours, periods of wind slackness or availability of biomass. Base load electricity can be boosted from thermal gas plants rather than coal plants. Gas is much cleaner than coal and more cost effective. Last year, the UK’s electricity generation from coal fell to its lowest level since industrial revolution from 36% in 2013 to 29%. This sharp decrease was attributed to the fall in gas prices compared to coal, making gas more economical to use for electricity generation. Whatever feeds the grid, the question remains whether the existing grid infrastructure is robust enough to accommodate substantial power generation increase beyond its current transmission wheeling capacity of 5000MW? And how long will it take to expand the grid? There is no quick fix for the grid. Repairing it will take a long time, expanding its capacity and reach will involve extensions, which require huge investments. The existing grid also lacks the ability to function smartly to accommodate intermittency from renewables. Despite the intermittency of renewables like wind and solar, these resources are far from being unreliable. Even with conventional power supply, there is a planning process that ensures consistency in electricity supply to meet demand. For renewables, the planning involves balancing sudden fluctuations, having reserve capacity, having a mix of complimentary sources and having spare capacity from a conventional source to smoothen supply. Numerous countries have been able to integrate electricity supply from solar and wind on the strength of modeling and predicting aggregate renewable power available to the grid from existing resource data with reasonable accuracy. It boils down to having a robust grid infrastructure and an enabled operator that can seamlessly integrate conventional and renewable generation to consistently meet demand in an efficient electricity market. The quick win for Nigeria lies in decentralized renewable power such as Pay-As-You-Go solar. These individual solutions can bring electricity to millions of households, small and medium sized enterprises within months rather than years. This option needs the least investment and regulatory framework – it’s a ready to roll project. And for once, this power would be power in the hands of the people who have been waiting, for too long. Hannah Kabir is the managing director of Creeds Energy, a renewable energy company based in Abuja, Nigeria. She is a member of African Renewable Energy Alliance, Energy Institute UK, International Institute of Business Analysis (IIBA). She is also currently an executive member of the Renewable Energy Association of Nigeria. While the tax credits provide a short-term teamwork to invest in solar equipment earlier, there are also significant long-term economic benefits. Nigeria‘s population of about 170 million people share 4,000 Megawatt of electricity between them. That amounts to about 3 light bulbs per person. However, Nigeria sees itself as a future world economic power. So how is Nigeria going to power its envisaged economic growth? What is Nigeria’s energy future? This web portal is the online presence of the Alliance on Nigeria's Energy Future, a discussion platform aimed at broadening knowledge of, and deepening public dialogue on, the possibilities of leapfrogging into a cleaner energy future in Nigeria. The Alliance aims to provide information and insights, and organise exchange of views between citizens, politicians, private sector, experts and civil society organizations on the various options for a sustainable future energy mix for Nigeria. Hosted by the Nigerian Economic Summit Group (NESG), this website is facilitated by the Heinrich Böll Foundation, in partnership with other member-organisations of the Alliance.